The valid question is – what does this have to do with the F6. The answer is, nothing at all. But trust me, it’s a worthy diversion. The Ultimate System Camera – Nikon F2 Photomic, front view: shown with MB-1 battery grip, MD-2 motor drive, AN-6Y strap, AS-1 hot shoe adaptor, AR-1 shutter release, MF-3 replaceable back and DP-1 metered prism finder (which is what makes it a F2 Photomic). Nikon F2 Photomic, rear view: shown with MB-1 battery grip, MD-2 motor drive, AN-6Y strap, AS-1 hot shoe adaptor, AR-1 shutter release, MF-3 replaceable back and DP-1 metered prism finder. If you’re interested in the F6, you should also take a serious look at the F2 line up. As with other “last iterations” the F2 is considered by many the finest SLR Nikon – or anyone else for that matter – has ever built. It’s also been labeled the “most beautiful” camera ever built by some. What I mean by ‘last iteration’ is this: in manufacturing terms the final version of something before a large-scale change is often times the best, most refined, successful version of that something. It leverages all the knowledge and experience the manufacturer has learned up until that point and rolls it into one, final masterpiece. In the case of the F2, it represents the last of the hand-assembled, all-mechanical single-digit professional F-series film cameras from Nikon. The F2 isn’t simply a refinement of the famous F preceding it – it’s a complete re-design leveraging everything they learned making the F and rolling it into this lady-killer hunk of a camera. After the F2 came the F3 which was assembled using more automation and employed electronics for basic operation. 40+ years after the roll out of the F2 it’s still considered by many the finest camera ever made. This year I’ve been working on something I’ve had in mind for a while: acquiring one of each of the single digit Nikon F professional SLR cameras. 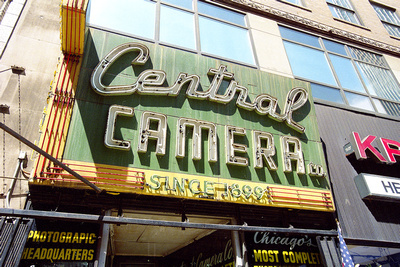 This summer while in Chicago I had the opportunity to visit Central Camera and from the shelf a beautiful, old (and I swear lonely) F with the FTn Photomic prism called to me in a way I just couldn’t ignore. Soon after we left the store for our first stroll together through the city to get acquainted. Prior to this July my knowledge of the older Nikon systems was a little sketchy. OK, it was inept. I knew they were legends – but most of my serious time behind the now vintage Nikons began around the F4 days and I hadn’t paid much attention to the older F’s. This year that has all changed. Can you imagine what was on these shelves in 1899 in Chicago’s Central Camera? If the “F” leg of my journey began by happenstance, the F2 leg began as an act of benevolence from my good friend Mark. He’d been using his F2 for a while and decided to pick up a newer, nicer one. Soon afterwards I received an e-mail saying he was sending me his original F2 Photomic. I was humbled by his generosity and honestly, not sure what to expect. I knew it followed the F and, for some (unknown) reason, I thought of it as “second best” to the F – like some sort of little brother that wasn’t as talented or good looking. Perhaps it had something to do with the fanfare the original F enjoyed because it was “the first.” Perhaps it was because the F2 lacked a prominent F2 on the front of the camera, as all following F’s sported. Perhaps because at first I errantly thought that F2 was simply a reboot of the original F. Who knows… no matter the reason, I was dead wrong. In anticipation I began scouring the web for as much information on the camera as I could find. As a new comer to the F2 there’s nothing I can add to the conversation that hasn’t already been said. What follows instead is this compilation of what I think are some of the marvelous and noteworthy discussions surrounding this camera. I’ve considered writing a head-to-head review of the F2 and the F6, but don’t really see a point to it: though they share the same DNA, one evolving from the other, they’re two, radically different cameras – each with their own pedigree and position in history – not just the history of Nikon, but in the development of the art of photography. The temptation is to ascribe one as better than the other and that’s something I refuse to do out of respect for both. Nikon advertisement summarizing how I feel exactly about the F2. The F2 was the last all-mechanical hand -assembled camera (think about that… over 1,500 individual parts assembled into one, highly-efficient, precision instrument), Nikon F-series camera. The shutter was hand assembled by mostly women in the Oi works because of their smaller hands and more delicate touch. The F2 has electronics only in the form of a battery compartment at camera bottom to run the DP-X metered finders. The Nikon F’s FTn head (shown on left) is larger and more angular than the F2’s smaller DP-1 head shown on right. This approach allowed designers to reduce the size and mass of the metered heads because they no longer had to accommodate a battery compartment as in the F. It was also assumed the present (early 1970’s) state of electronics development in the metered finders should be manufactured separately from the all-mechanical body allowing later swapping of rapidly advancing electronics with rock-solid mechanical engineering beneath. In short, the mechanics were expected to out-last the electronics – which of course proved to be true. Replaceable prisms remained a design cornerstone of Nikon professional cameras for many years to follow coming to an end with the F5. As we already know, the F6 no longer makes use of this design feature. The entire F2 (sans motorized grip) functions with no power what so ever. That itself is impressive. But even more so, the F2 is constructed with over 1,500 pieces clicking, twirling, humming, springing and dancing away inside that heavy-duty chassis every time you click the shutter. Simply amazing. Though at first glance it might be hard to tell the F from the F2, especially when they have eye-level (non-metered, triangular) finders, when design to the successor of the famous F began in September, 1965 the decision was made to start from scratch. This was further reflected by Nippon Kogaku’s changing from their traditional letter and number development code, to simply “A.” Eventually in the design cycle it was recoded “30FB.” The F2 design team was all in-house and had four main goals: a) Design a camera of the highest quality, b) quick and easy operation, c) a systemic approach allowing expansion, and d) continuing down the path to automation. F2 styling employed a slightly rounder feel softening the hard edges of the original F ever so slightly. There’s also a good bit of accessory cross over between the two cameras. The non-metered (classic triangular) prisms are interchangeable between cameras, as are 20 different focusing screens. Other accessories like the AR-1 soft-shutter release and AR-2 cable release are also compatible between the two cameras. Despite first glances and shared accessories there are many changes and design refinements between the F and F2. The F2 has a a distinctive, “mechanical” look to it – different than the following F3, F4, F5 and F6. It wasn’t until the F3 that Nikon brought in the Italian designer Giorgetto Giugiaro, changing the face of the following F-line forever. Though I admire the sleek design of the later F’s, there’s something wonderfully solid about the glorious apparatus surrounding the F2. From MD motor drives to MB battery packs, 250 and 750 – frame replaceable backs, early auto exposure contraptions, as well as a cornucopia of other accessories covering virtually every photographic scenario one could imagine – everything bolts to the F2 with that famous, Nikon assurance that you’re holding something in your hand that’s probably going to outlive you. The legendary F and F2 seem more similar than different-especially with their metering heads removed. Above, the F is shown in front, the F2 shown in rear. Some components are interchangeable, like the focus screens and of course the lenses. One of the great benefits of an all-mechanical camera is the environments capable of functioning in that electronics either wouldn’t survive (like the arctic) or where highly flammable conditions exist. A great story surrounding the F2 centers around Japanese adventurer Naomi Uemura who came to Nikon with the simple request in June of 1977, “make me a camera that can survive the North Pole!” That camera was a modified F2, a camera capable of functioning at temperatures exceeding -50°C (-58°F). Nikon built Uemura 3 F2’s with which he shot 180 rolls of film over a 6 month period trekking across The North Pole and Greenland. You can read more about this remarkable adventurer and the details of how Nikon worked closely with Uemura to develop a camera specifically for his needs here. The more I read, the more I realized what an incredible engineering feat the F2 was – and still is. Manufactured from about 1971 to 1980, it represented the most robust “system” camera Nikon had ever build. It spanned many (6 primary) model variations ranging from original F2 with the unmetered DE-1 prism to the pinnacle F2AS, as well as exotic derivatives. Limited production runs such as the F2 Uemura (3 were made), the F2 DATA, of which reportedly only 1,000 were made, the F2T for Titanium, and the F2H, for High Speed – which had a special mirror designed for super high-speed shooting. Any F2 viewfinder will fit any F2 body. Somehow the original Nikon AN-6Y yellow strap – complete with metal buckles – is the perfect companion for a camera like the F2 + MB-1 Battery Pack + MD-2 Motor Drive. At 40+ years old now in many respects the F2 represents the pinnacle of mechanical engineering – prior to moving to the advances of the electronic era. The lore that surrounds this camera is almost a fairy tale; a synopsis of world history from the early ’70s through 1980. Rumor has it that the original F adaptors were initially slow to move to the F2. The same thing happened when the F3 was launched – with many photographers opting to pay more for the older, mechanical F2 instead of trusting ‘them new fangled’ electronics. Regardless of the initial reluctance, the camera did famously well and reportedly over 800,000 units were produced from the fall of 1971 to the cease of production in 1980. Reflecting the shift in photography of the day, the F2 was superior in forma and function and served as the final coup de grace to the German rangefinders. I suppose that’s more an op/ed statement though, anticipating an outcry from the German camera crowd. Let’s just say in the context of the working press of the day it’s subjectively true. For anyone interested a deeper history of this camera I encourage you to check out the references at the bottom of the page. The camera arrived and as so many others can attest to upon experiencing it in hand for the first time, my jaw hit the table. To borrow a phrase from Tomohisa Ikeno describing the Nikon F6, the F2 is indeed also “a camera of great substance.” Any previous thoughts otherwise instantly vanished. The F2 is deceptively heavy for its rather smallish size compared to today’s cameras. As the camera appears in the photo atop this page, he weighs in at an impressive 4lbs 7oz. So, not exactly a featherweight. This is not a negative – I like the solid feel and welcome the balance the camera produces in hand. It’s a beautifully simple camera to operate, on par with the original F, though with a few more “shootability” traits. Maximum shutter speed was increased from 1/1,000 in the F to 1/2,000 in the F2 allowing one to work with larger apertures in brighter light. This is an even more amazing feet when you consider it’s all mechanical, horizontally traveling titanium foil shutter. The differences between the F and F2 on top at first glance appear subtle. In use, they’re more noticeable. The F2 (left) is shown tucked safely in the CH-1 hard case bottom, while the F is wrapped in its appropriate ever ready case bottom. The shutter release button was moved forward on the top plate making it a bit easier for a naturally placed finger. Functionality of the shutter release collar was expanded to allow T (time) shooting (using the self-timer lever on the front of the camera), a normal shooting position, and a L (lock) position to prevent accidentally tripping the shutter. The film advance lever was now tipped in plastic, providing a greater sense of human engineering compared to the bare metal lever of the F. It was also given the additional duty of turning the camera’s meter on and off by rotating it out which reveal a red dot on the top plate. The film advance lever had a short throw (only 120° of rotation) allowing quick film advance. The frame counter was removed from the film advance lever to the top plate. Perhaps most notably however was the back door of the camera was now hinged allowing one to change film more easily, rather than having to remove the back completely as with the F. Other refinements also went into the F2. For all the F2 detail anyone could ever digest I invite you to visit the MIR F2 Index page. You’ll get lost for hours in this incredibly comprehensive resource about the camera. The month or so since first unboxing the F2 has been a bit of a whirl wind. The copy generously sent to me was usable, but had seen better days. I decided I’d try to obtain a nicer copy. There are a few things about the F2 I’ve learned in my recent acquisition phase from auction. One is, moderate to decent F2’s aren’t terribly expensive. 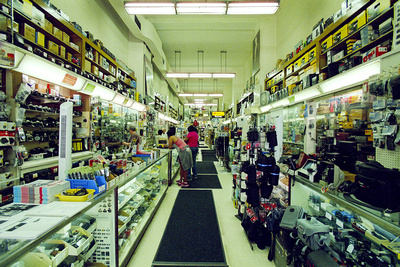 I’ve seen them range from about $100 to $200 for average to good condition cameras. Even less if you pick up a F2 body with no finder. This is great news. The not-so-great news is, if you’re going to shoot it, you’d better be prepared to put a little money into having it refurbished. These are old, mechanical cameras – some of which were used hard. I recently picked up a body for the princely sum of $65 listed as “working fine” and in “top condition.” It looked presentable from the exterior, but it surely wasn’t in top condition. One of the achilles heal in older F2’s is the plastic battery compartment shattering. When it does, not only does no power reach the metered prism, but even worse, little pieces of plastic jam the film transport mechanism. The fix requires surgery: a costly strip down to the chassis to epoxy or otherwise repair the battery compartment. While they’re at it, a good CLA makes sense. So my $65 bargain ended up costing a couple hundred by the time it was repaired. Lesson learned. Secondly, Nikon’s early assessment that the finders would peter out before that stout mechanical body proved true. Finding a good, working DP-anything isn’t as easy as you’d think. Again, these are 40 years old and early electrical technology. Many finders are “jumpy” or inconsistent or not working at all. There are a few places that will fix them – but it’s not cheap. Nor are the unmetered, original DE-1 finders in good condition. So again, to have a good F2 shooter you’re going to spend a little money. However – when the total cost of obtaining and repairing a solid F2 are compared to what the same expense would purchase in today’s consumer electronics, there’s no comparison: you’ll get a lifetime camera in the F2 vs. something that’ll sell at a garage sale in a couple years for $50 (I’m talking about the digital, by the way). You might get lucky like I did and find a decent DP-1 metered prism for a reasonable price. Thus, my humpty dumpty F2 was assembled in such a way and looks and functions great – with a little TLC by a factory trained Nikon technician. The thinking is, at 40 years old and with a recent refresh this camera will outlive me. I’m OK with that. Regarding serial numbers and dates of production, visit this serial number chart for reference. This is another subjective assessment. Whatever camera one uses repeatedly and grows accustomed to is going to feel comfortable in hand. It will become that “extension of one’s self” people (including me) like to say when describing how you’ve used a camera for so long and know it so well, there’s no longer an adjustment necessary when you pick it up. You just shoot. To the long-time user of the F2 – as with anyone using any other camera for a long time – it’s highly shootable. To the newbie – it’s also highly shootable. The base configuration of the F2 with the metered DP-1 finder is an all-manual camera. In contemporary context if you think S for shutter priority, A for aperture priority, P for program and M for manual, the only mode the F2 has is M – manual. The DP-1 provides an adequate meter with which to gauge exposure – though the electronics and sensitivity of that meter aren’t on par with today’s camera – especially the F6. No matter – it’s plenty good enough and you can rely on it getting you in the ball park. It is center-weighted, taking into consideration the entire frame but weighting preference to the center of the frame – suitable for most general purpose photography. The photographer experienced with basic fundamentals of determining exposure will be able to do anything with the F2 they can do with any other camera – perhaps just not as quickly. Again – this is all subjective. Please all you old-school F2 shooters don’t take me to task on this statement; it’s not directed at you. I’m talking to the those used to a different metering system and to the adjustments they’ll want to make to be successful with the F2. The DE-1 non-metered prism finder is a different matter. With no meter at all you’re left to determine exposure any number of other ways (like with your own light meter, or superior intellect). In that case the un-metered F2 will fall into your hands like a well-worn glove ready to respond to your every command. It is SUPERB. I’m kind of a nut about stuff like this – the warm, squishy attributes of a camera. How it feels in the hand. Its a big deal to me. Something clunky and awkward you hate to hold is not going to get held. Consequently, not going to make pictures. The F2 is a dream. I’ve heard the term “built like a tank” so many times it has become a meaningless platitude. So let’s come up with a better way to describe the F2. I’m drawing a blank at the moment. The Nikon F2 shown in 2 different configurations: on the left, the F2 Photomic in chrome, on the right the F2s in black. Another fun thing about the F2 is all of the beautiful – but way overpriced accessories. The “collectors” have driven the price of this old gear through the roof. Something simple like a MF-3 replaceable back that allows leader-out film rewinding (with the MD-2 and MB-1) I saw at auction for $450. For a back. Buyer beware… just use your head, do your research and you’ll be fine. The F6 has a diopter adjustment built into the viewfinder. For the F2 if you’re interested in adjusting the diopter of the F2 you’re back to old school method of finding the appropriate one. As mentioned earlier the F2 and F share some of the same accessories for the F2 like focusing screens. Thankfully viewfinder adjustment diopters are another area the F2 leverages from other camera’s accessories, sharing the same diopter size as that of the FE line, FM line and FA as well as the F3 (not F3 HP which stands for High Eyepoint and uses a different diameter thread). So with a little creativity and digging you can still find genuine Nikon parts, or high-quality reproductions fairly easily for this 40-year old camera. If you’re into the old, mechanical nuts and bolts stuff that has a retro sound, look and feel – you’re going to go broke in the world of the F2. The accessories available for the F2 are vast. For a little fun visit the Nippon Kogaku Klub for some pretty exotic mechanical F2 gear. Over accessorizing is not a danger for him: the more bling you hang on him the better looking he gets. He’s a sculpture; a work of art masquerading as a 35mm film camera. The good news is you can pick one up at a reasonable price and have a blast shooting it stripped down to its skivvies’. It’s that great of a camera. Someone attempted to repair this DP-1 leatherette (the small, textured material adhered to the plastic or metal parts of the camera). You can see what a mess a hasty job can create. It’s easy enough and even fun to clean and polish your old, new-to-you F2 when it shows up. Even tasks like replacing the often crumbly, gummy foam seals in strategic positions of the camera are easily doable with the right tools and a little time/patience (check out Jon Goodman in Dallas, Texas. He’s your man for replacement foams). But when components fail – especially electronic components – it’s difficult if not impossible to find suitable replacements so long after the originals were discontinued. Another great thing about the all mechanical F2: in theory, it’s repairable. Thankfully there are a handful of qualified, dedicated artisans still available to make such repairs. Sover Wong’s image documentation as he progresses through the repair of your camera is unprecedented. All images are provided real-time as he works on your camera, then on CD with your camera upon return. At the top of the list is Sover Wong. Sover is a UK-based, Nikon factory trained, F2-dedicated technician. You can read more about his approach to repairing your prized F2 here. Sover is a legend in the F2 community. To have your prized F2 “Sovered” is to restore it functionally better than new. His shutter timing calibration exceeds Nikon factory specs. If you’re in the UK and need your F2 repaired you’re fortunate. Shipping round trip from the US adds another $100+ to the repair bill, which thankfully is quite reasonable for the level of attention he lavishes on these cameras. Upon receiving my F2S back from Sover it had a distinct ‘snap’ and smooth, quiet liquidity to operation. Having the internals of your F2 documented and provided on CD with the camera is a wonderful addition to the camera’s dossier. He records every serial number of every F2 he services and has a generous warranty and repeat service policy. Thankfully, Sover Wong’s inspection of the camera’s chassis interior revealed no fungus. Fungus is commonly found in cameras shipped from Japan and eventually destroys the camera from the inside out.. There should not be holes in the film advance lever cap. This is an example of what Sover Wong calls a “Cowboy hack.” You want your camera to be returned in better condition when you send it out for repair – not worse. There are others still around in the US who will work on your F2. Be careful though. I’ve heard and seen horror stories of people badly mutilating the camera in the process of what they call a repair. Some components require special tools to disassemble. Calibrating the shutter is another precise adjustment requiring someone who really knows their stuff. If you’re in Northern Colorado give Key Camera Service in Longmont a call (303-772-7690) . They repaired my jammed F2 and did a great job. Having an F2 loaded at all times is now standard operating procedure, right along side the F6 (and the F, F4 and F5). The appeal for me is the lack of electronics and the sheer sense of substance while holding it. While I love the F6 and continue to rely on it for every-day shooting, the F2 warrants special consideration from an artistic, idealistic and even – I’ll say it out loud – romantic point of view. I was talking with my wife about it the other day, asking her what she supposes it is that causes someone to fall in love with something 40 years old; that by contemporary standards is wholly behind in technology, lacking in many of today’s stated “necessary” features and frankly the antithesis of today’s modernly digital cameras. What is it about hoisting these cameras to our eyes, we whisper under our breath, “wow…”? What is it that makes us spend the time and money cleaning them up, recalibrating shutters, repairing viewfinders, and massaging them back into smooth, efficient operation to go out and make the same photograph many other cameras could make? Why do we do it? Passion. Romance. Feeling. Love. Lore. Appreciation for great engineering. That “X-factor” that can’t be measured, quantified or explained when you hold the sum of over 1,500 individual parts designed, manufactured and assembled into one, precision instrument you now hold in your hand. A device that’s part of history. I believe it’s the very essence of photography; the attribute elevating the mechanical process of clicking a button from the common realm to the ethereal. Making art with art. Poetic, even. I’m of course not saying there’s only one camera capable of this. But I do believe for each person who hoists their favorite, old film camera to their eye and squints into the viewfinder; fingers caressing and adjusting knobs, breath steaming the camera back, eyelashes sticking in the viewfinder… there’s something going on more than simply using a light-tight box to execute a mechanical process. We can admit it… we’re among friends. It’s all part of the “art” of photography, and we know it. So what’s all this have to do with the F6. Nothing, really. Other than when you shoot the F, F2, F3, F4 and F5 you begin to appreciate the F6 DNA all the more. Trying to answer the question ‘which is your favorite’ is a cat chasing its tail. Each photographer has preferences based on their experience: specific cameras which trigger memories from long hours spent with them in hand, or admiring one over another for aesthetic and design preferences. But best… why bother? Just shoot and enjoy each as the spirit moves you and simply enjoy them for what they are: works of art masquerading as 35mm film cameras. 1. Maximum Impact Research, or mir.com’s section devoted to the F2. It’s exhaustive and you’ll be lost in it for hours, guaranteed. Invaluable for everything from a wholistic understanding of the system to drilling down into finer details of specific devices and accessories.